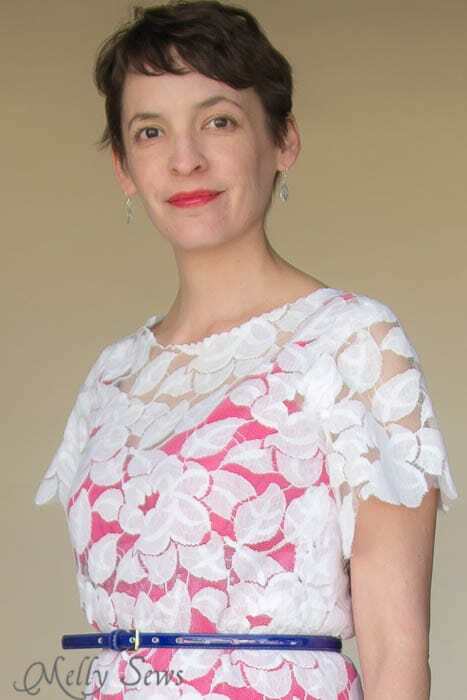 In yesterday’s post I showed you a lace dress version of the Shoreline Boatneck pattern that I sewed. 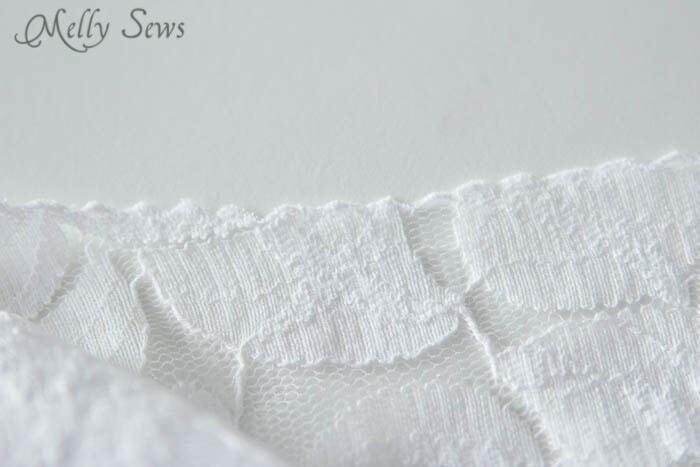 Today I’m going to talk more about how to sew lace – there’s an art to it. Look at the picture below – can you find the seamline where I attached the sleeve to the shoulder? I hope you had a hard time with that. 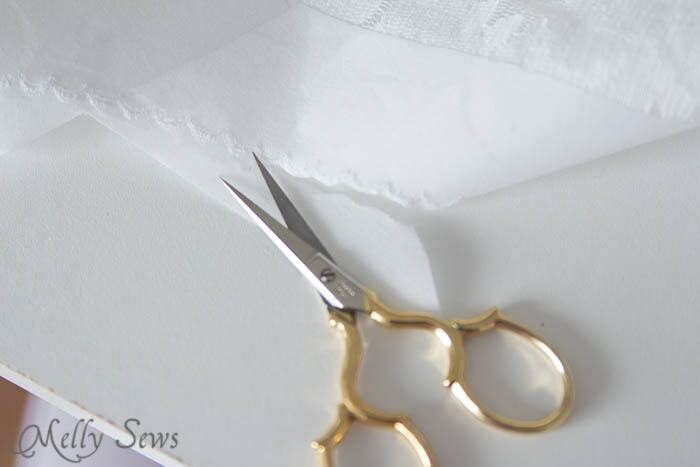 I worked pretty hard to hide the seams, and today I’m going to show you how to do it. 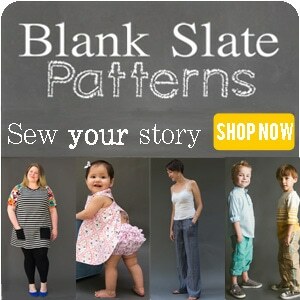 It starts with how you cut out your pattern. Or don’t cut it, that is. You’ll want to trace it onto tissue or lightweight paper that you don’t mind throwing away when you’re done. Because you’re going to be messing up the paper totally. 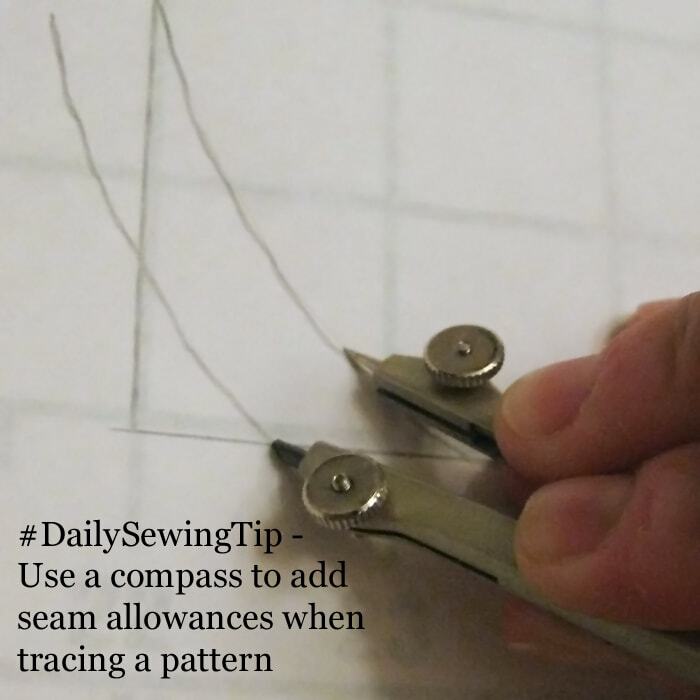 Make sure to trace both the pattern edge and the stitching line if your pattern has both. If it doesn’t, you’ll want to go back with two pencils taped together or a compass to draw in the stitching line. This is actually one case where a European pattern without seam allowances added onto the pattern pieces might be easier. 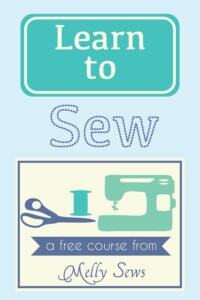 If you like these daily sewing tips you should follow me on Instagram to get them first. 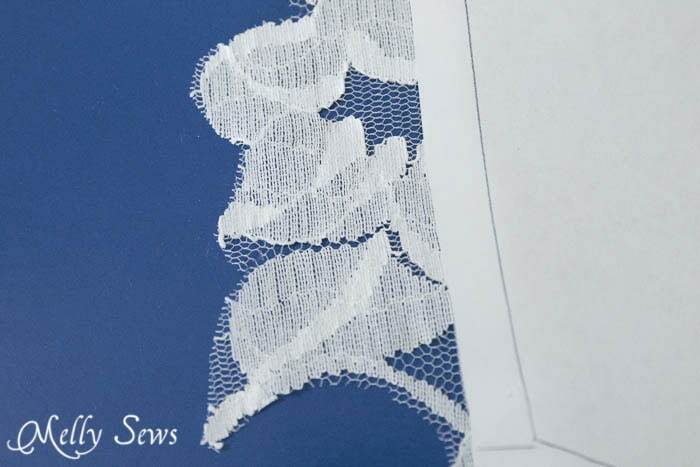 You’re going to cut out each piece in a single layer, and trim around the pattern in the lace. This means that the lace edges will extend beyond your pattern edges pretty much everywhere. This is a close up of how I trimmed lace around one pattern edge. Now here’s where you want junk paper. 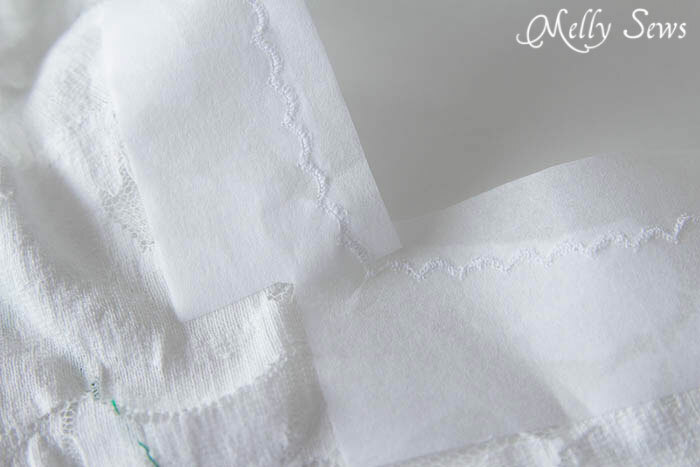 With a contrasting color thread in BOTH your upper and bobbin threads, sew through the paper onto the lace with a basting stitch. Tear the paper away, leaving the basting stitch. Below you can see how I did this for a sleeve. 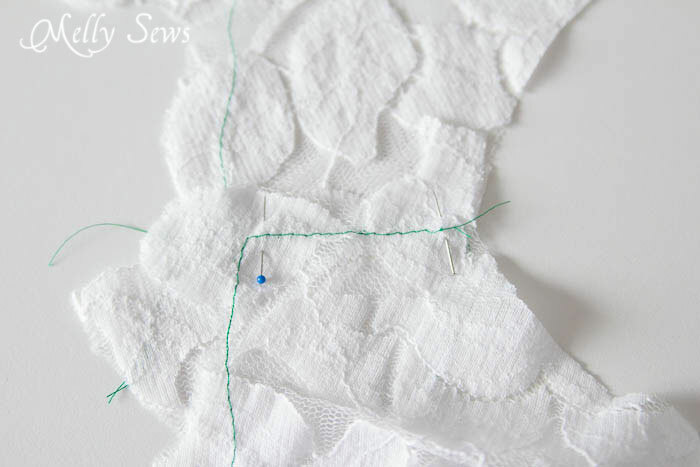 Now, instead of sewing your seam in the typical manner, you need to overlap your lace so that the basting threads from the two pieces lay right on top of each other. 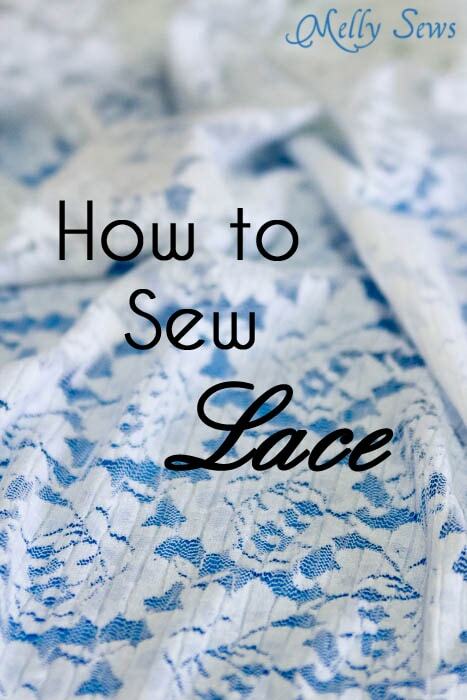 Change your top and bobbin thread to the color that matches your lace. 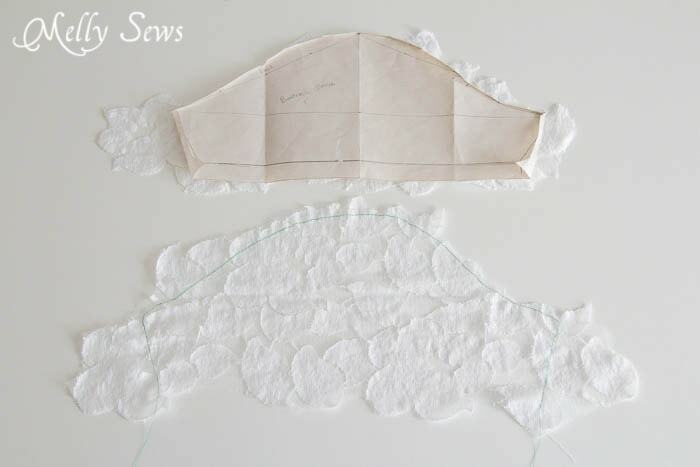 Then with a medium width and medium length zig-zag stitch, stitch over the edges of the lace, like an applique stitch. You’ll need to do this on the right and wrong side since the pieces are overlapping each other. Pull out the basting threads. Below is my overlapped and sewn shoulder seam. As you can see, the seam line has pretty much disappeared with this method. The green thread on the left is where my sleeve is going to be attached next. Now I did cut the neckline edge according to the pattern, because I didn’t want irregular lace messing up the shape of my neckline and this particular lace had a big pattern. 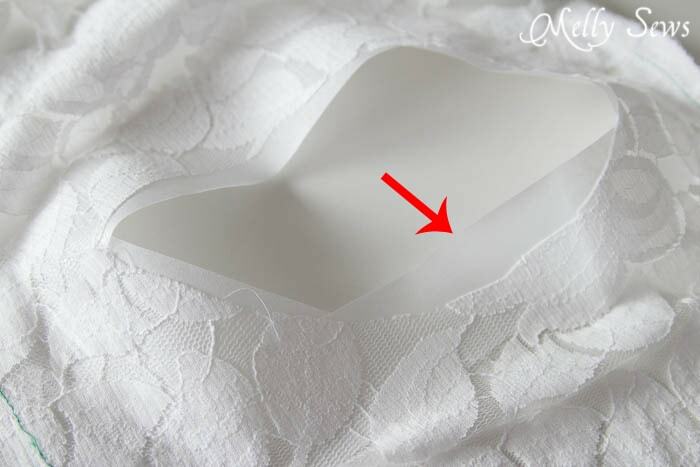 So let me show you an alternate hemming method – this would work on the bottom hem too, but I decided I liked the bigger uneven lace there – it looks like an expensive lace edged trim to me. Start by reinforcing the neck edge with some sort of stabilizer. I used fusible tear away embroidery stabilizer. You could also use temporary spray adhesive and tissue paper, or Stick N Washaway, or other similar products. I cut my stabilizer into strips and ironed them onto the neckline. And actually, this doesn’t even have to stick to the neckline, though making sure it sticks helps prevent accidental stretching. But you could also just sew over tissue paper in a pinch. Then I set my machine to sew this scallop stitch, which is one of my built in stitches. You could use any decorative stitch that is thread heavy – in other words something that has a lot of zig-zag action in it’s creation. You want stitches that are close together, too. I stitched all along the neckline edge with this stitch. Next I cut away the stabilizer AND lace right along the outside scallop edge. I used tiny scissors to make sure I was cutting the little scallops as precisely as I could. Finally I gently tore away the rest of the paper, which left me with a neckline that was shaped the same as the pattern and with this tiny scalloped edge. Spot the seams …if you can. Mwahahaha! I didn’t do anything to the bottom edge of the dress, I just trimmed the lace to the edges of the lace pattern and let it be. So yes, it took a lot more time and work than regular fabric seaming. But lace dresses are classic, and I intentionally left this one unlined so I could play with different things under it. In fact, come back tomorrow to see it styled 3 different ways. such fabulous tips and i love how you did the neckline!! thanks! Wow, I had no idea how to sew lace so nicely. I probably would have tried french seams and rolled hems. wow, thanks so much for putting together these fantastic how-to pics and instructions. I’d been contemplating a lace project for some time now, and I *know* you’ve saved me a lot of experimenting and frustration. 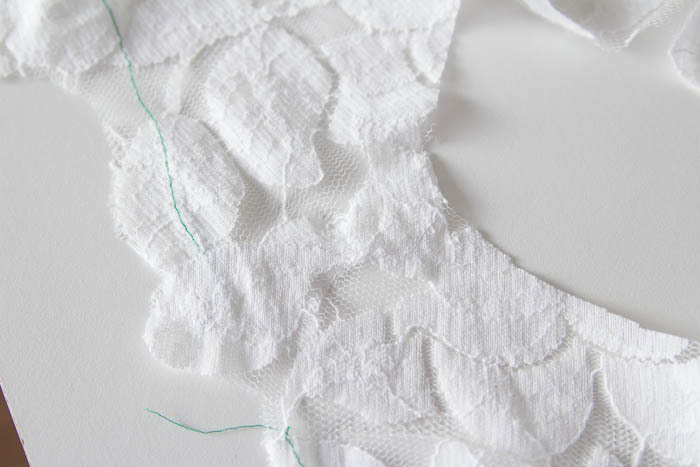 What great tips on finishing the lace seams. Also love the dress just in lace and putting various colors underneath. Brilliant! My goodness, what a wonderful piece of work. Very impressive. Congratulations and thank you for sharing. Love the dress! I am getting ready to tackle a lace dress for myself. I was wondering – when you cut the fabric out larger than the pattern and cut around each edge of lace , how much extra do you allow beyond the cut edge of the pattern? -When you stitch the seams together are you actually trying to match the pattern or just disguise the seam line by zigzagging the seam flat? Also – did you use stretch lace or regular? What patten did you use for the under slip? A very nice garment with all the extra care taken to cut out and match up the lace. Just lovely. Thank you so much for sharing. Love the dress ❤️??? ?